For many years now, I have been trying to read the Bible every day. 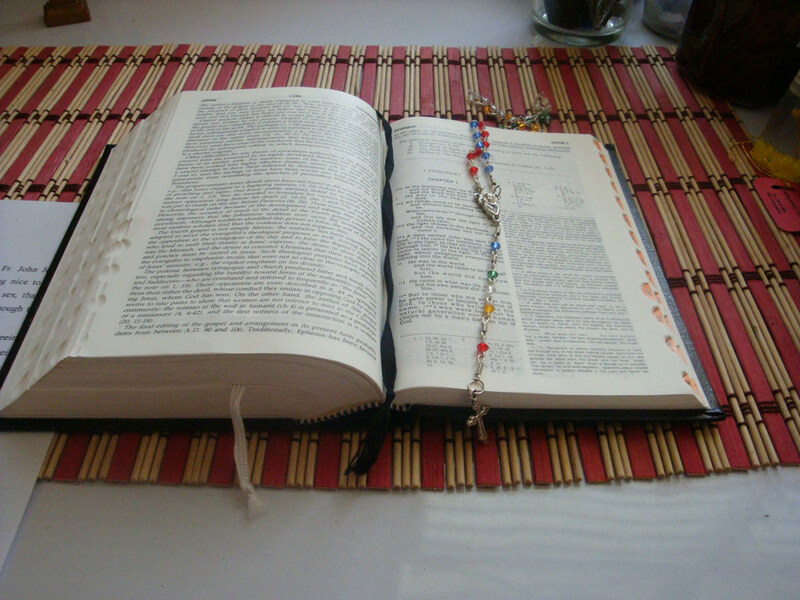 I follow the daily lectionary in the Book of Common Prayer offered by the Episcopal Church. I read some Psalms, a passage from Hebrew scripture, a passage from one of the four gospels in the New Testament, and a passage from what comes after them, often called the Epistles. Sometimes I am in a hurry, and I just rush through it. And I learned long ago that, if I were to find meaning in what I read, the meaning might lie in how I disagree with the sentiments expressed in the writings, rather than in any consolation or guidance I find. The Bible is like a housemate. You can disagree and still be friends. In any case, I kind of like my housemate. I approach her with a sense of affection, and I think that she approaches me with affection, too. This is one reason I appreciate Rabbi Artson's article. He reminds me of the affectionate side of the Bible and, for that matter, the affectionate side of God. How affectionate is God? Having read his God of Becoming and Relationship: The Dynamic Nature of Process Theology, I know that he believes in a God who dwells in covenant with Jewish people, to be sure, and who also dwells in loving relationship with all people and with the earth itself. And having read his God Almighty? No Way!, I know that he believes that this God of love and inclusiveness is continuously present to creation and shining through the cracks of life, but never in a coercive way. For him as for me, God is all-loving but not all-powerful in a traditional sense. "God cannot force us to love ourselves or each other." My own hope is that, in reading the Bible every day, the Bible might help me love a little better. It can help me become what Patricia Adams Farmer calls a Fat Soul. A Fat Soul is someone who can love other people and the rest of creation with range and depth, who is open to multiple points of view and doesn't think he or she always has the right answer, who can seek harmony in life but also accept and embrace enriching tensions, who lives with integrity and is not simply following the whim of every fashion, and who has a sense of individuality -- unique and maybe even weird -- but does not fall into the cult of individualism. A Fat Soul knows that every individual is, in the words of Rabbi Artson, a flower of divinity. I would like to offer you a relationship to the Bible that allows us to do what, I think, it was originally intended to be, which is a source of light, a source of affirmation, a source of deeper humanity. The Bible that you hear preached by some is a bible of rules, a bible of rigidity; occasionally, a bible of fear. This is not what draws me to the Bible, and it is important that somebody publicly present a different take. So back to the question: Can reading the Bible on a regular basis, in community with others and guided by traditions, help a person become a Fat Soul? The answer, it seems to me, is: Sometimes. I offer three principles of interpretation gleaned from Rabbi Artson's approach. I will call them the Artson hermeneutic. The first principle is that, when the Bible gives you a lemon, turn it into lemonade, because God is present in your reading of it. You can do so by finding hidden meanings which add sweetness to what was otherwise too tart, or by disagreeing with it. God is a calling presence, inside each of us, to live with respect and care for the community of life. This is part of the wide mind toward which God calls us. Read the Bible with the flower of divinity inside you. It helps to begin with prayer. The second principle is that, whatever else lemonade might taste like, it tastes like inclusion and love. Along with Rabbi Artson, let these two themes be among your guides, knowing that they, too, come from the Bible. You might add justice, too. They are essential ingredients in the lemonade, as Rabbi Artson makes clear in What's The Bottom Line in Judaism? Love and Justice. The third is that, sometimes and maybe even oftentimes, the Bible supplies the lemonade, and the task is for you to listen and become lemonade yourself. Sometimes the calling of God is to be challenged by the Bible, to hear the way its stories destabilize inherited forms of un-loving and non-inclusive thinking which are self-serving, self-centered, and self-loyal at the expense of world loyalty. They are prophetically powerful. They turn you upside down in a good way. I have to admit it. There is a lot in the Bible that I have to disagree with in the interests of love, justice, and inclusion. But I must also admit that I probably wouldn't find these themes as important as I do, were it not from things I've learned from the Bible, including the stories offered by Rabbi Artson. I like my housemate. We are staying together. The Bible starts with two profound stories: The first story we are given is of a God who cannot bear to be alone. A God who is driven by love to create a world of flowering and cascading diversity in which nothing is precisely like what came before it; in which each new creature is delightfully fresh and novel; in which God, thrilled by each new creation, says: This is good. And then God creates a creature with the capacity, also, to look at diversity, and to look at novelty, and to say: This is good! And we are told in this story that we are made in that God's image. What is the characteristic of the God of Genesis? Unearned love that can only be made real when it is given away. And so without obligation, God creates a diverse and flowering universe, because God cannot be God if God cannot love. We are, my friends, in God's image. And we also, though, shrivel up and die if we do not have the ability to pour out our love; to celebrate difference; to rejoice in novelty; to see in each other's divine sparks; and to be delighted and thrilled by what we see. That is, says the Bible, our most God-like attribute. The second book of the Bible, the Book of Exodus, tells the second foundational story of Western civilization. It is the shocker! The story tells of an obscure small group of people who are described by the Hebrew term to'evah -- abomination. Those people are so abominable that the Egyptians will not even sit at a table with them; they will not eat with them; they force them to live in a different neighborhood so they do not have to deal with them. And they oppress them, ruthlessly and harshly. And the Torah announces that the force that created the cosmos, the force that is known in the giving away of unearned love, that force cannot abide pharaohs. That force will rise up on behalf of the oppressed, on behalf of the abominable and that force will set them free. We Jews know that as our core story. Every year we recall that we, each of us, were slaves in a land that viewed us as outsiders, and that we were visited by the very forces that make the universe what it is: forces of liberation and freedom and wholeness. And that we were brought out of that narrow land into a place where we were free to be ourselves. I am not making these stories up; I am not that good a writer. I am telling you, that the guys who are preaching hate are skipping the most important stuff. The God who is found on every page of the Bible is a God of love so radical, says the prophet Jeremiah, that it is an unending love; an eternal love. So my message for you is that if you see someone hold up this Book, and sound full of fear and hate, they have not really read it right. We need to be the love. Love is not flighty; love is not fickle. Any of you who have truly loved know that love is resilient and persistent and determined and irrepressible. We need to face the people who are so afraid that they speak in hate. We need to face them with the resilient love that resides in justice. We need to let them know that the One who created each of us special and different delights in difference and sees all of God's children as flowers of divinity -- each of us as special and precious. We need to remind them that we learned those lessons right here, in this Book. That love reverberates right here, in our hearts. It echoes right here, amidst our families and our loved ones. Freedom and dignity are indivisible. Either they include all of us, or we are all of us in danger. Those who are judged by the color of their skin, by their gender, by their faith or their lack of faith, by their looks, by their orientation, by their abilities or by some people's perception of disability, need to remember -- all of us -- that we already the way God would have us be, with one exception: God cannot force us to love ourselves or each other. We have to do that ourselves. For a online bibliography of scholarly resources in Whitehead-influenced biblical studies and process hermeneutics, click here.